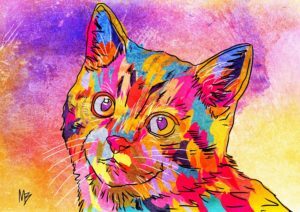 I recently set up shop at a local pet expo to sell my pet art and receive custom commissions. I love doing these shows because I get to interact with people and their pets. It also helps me to explain some of the process in commissioning a pet portrait and often uncovers many questions people have. Do I create the art live in the booth or need to do a home visit? (No. I use photo reference). Do they need the photo available in order to complete the purchase? (no. you can email me a photo or two and we can talk about what works best for your needs). After all, this is a big decision, and one doesn’t want to feel the pressure to choose the best photo on the spot to have their custom art created from. So I thought I would walk through a little bit of the process to bring some insight and perhaps answer some questions you might have. The first thing may seem obvious, but ask yourself “why do I want a custom pet portrait?” We have such special relationships with our pets. They love us unconditionally. They greet us when we come home from a bad day at work. They snuggle with us as we watch tv or read our favorite book. They make life sweeter. And the idea of creating portraits comes from the desire of wanting to celebrate an important relationship in our life. It might even be to help remember and memorialize a beloved pet who has passed on. These portraits become visual markers, that help us celebrate and remember. This is why I create custom, one of a kind pet portraits that capture your pet’s unique personality– so you can treasure them for years to come. OK, so once you’ve decided a custom pet portrait is right for you, it’s time to decide on the right size and options. If you have limited wall space, or already have some previous pet portraits you intend to hang this new one with, you might consider an 8×10 print. Do you have large wall space? Maybe a 30×40 inch canvas is the best fit for you. I currently offer 6 sizes: Standard- 8×10 & 11×17 (on a high quality luster photo paper with archival inks), Premium- 16×20 & 20×30 inch museum quality gallery wrapped canvas prints, and Platinum- 30×40 & 36×52 inch museum quality gallery wrapped canvas prints. Custom sizes also available. This is really all you need to finalize your order through my website’s shop. I have created a page to help walk you through options and all you need to do is add the desired option to your shopping cart and check out. One option that is unique to my pet portraits is the choice of natural coloring of your pet, or you can choose what I call the “Rockstar” treatment, vibrant colors. Choose what fits your pet’s personality, or yours. Or what you feel will work given the colors on your walls. Next up – do you want a headshot or full body portrait? If you’re not sure, you can send me your photo reference and we can talk about what might suit your needs best. I also get asked if more that one pet can be in the portrait. The answer is yes! There’s even an add-on to place in your shopping cart for each additional pet. One note: I do not recommend more than 2 pets in the same portrait in smaller sizes. You won’t be able to appreciate each pet due to the size. Are there certain colors you would like in the background? No problem. We can talk about what would work with the options you have chosen and get you the right fit. Once you have check out, emailed your photo(s) along with your custom options of coloring and headshot / full body, I start creating your custom portrait. When ready, I then send you a digital proof for approval. Upon approval, I create the final art and print. For canvas options there is an additional 7-14 days for manufacturing. My goal is to make this process as simple and personal as possible. 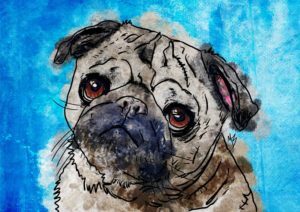 So are you ready to get your custom pet portrait? Click here and let’s get started today!